If you ever publish reviews of books on your WordPress blog or website, then the free Book Review plugin is something you should definitely take a look at. With this plugin installed on your website, your book reviews can be formatted in a more informative and attractive way. The plugin adds a series of fields to the WordPress post editor screen, allowing you to add detailed information about the book you are reviewing. You also get the option of integrating the Google Books service with your website. 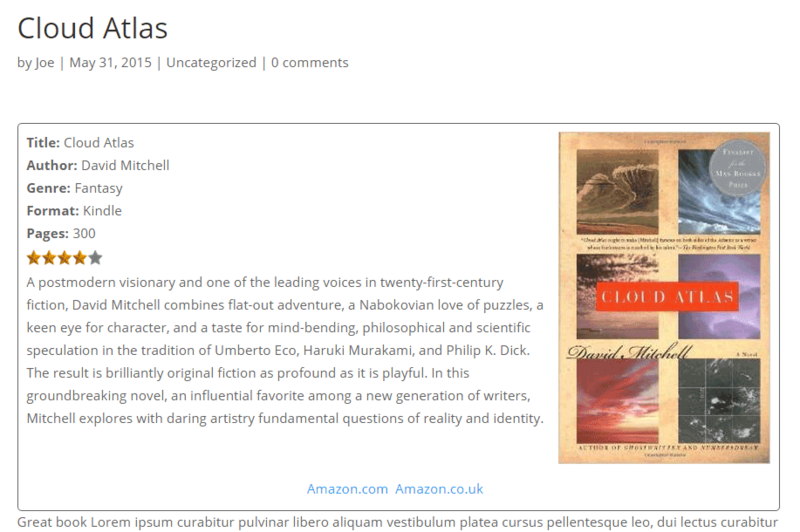 This then allows you to then automatically populate your reviews with the book details. The plugin will also make your reviews stand out in the search engine results pages, thanks to its ability to display review related content there. This includes the date the review was published, the name of the reviewer, and the star rating you’ve given that book. With the Book Review plugin, you also get an easy way to add affiliate links to your reviews. This can help you monetize your content by earning a commission whenever someone purchase a book after reading your review. Other features of the Book Review plugin give you the ability to output a list of all reviews in one post using the included shortcode, displaying the book review content either above or below the main post content, and customize the colors used in the formatting of your reviews. You can see the plugin in use on the reviews on the Book Wookie website. As the Book Review plugin is free to use, it can be installed on your site directly from the WordPress plugin directory. From the Add Plugins screen, enter âBook Review’ in the search field, and then install the first item listed in the results. Once the plugin has been installed and activated, the settings can be accessed from the newly added Book Review item, located under the Settings sidebar menu. From the plugin settings, you can set the position of the review box, change the colors, and upload your own rating images. You can also add a series of custom links that will be shown with every review. These could be links to book retailers where your readers can purchase the book you are reviewing. Whichever custom link fields you add through the settings page, they will be added to the Book Info meta box which is displayed on the WordPress Post editor screen. This then allows you to add direct links to the item you are reviewing on the websites of your choice. If you sign up to an affiliate program, like Amazon Associates, you can earn a commission for each item that is purchased through your links. Through the settings you can also integrate the Google Books service with your website. This allows you to simply enter the ISBN number of a book when reviewing it. This will then automatically insert the information about the book into your review. Detailed instructions on obtaining a Google Books API key can be found on the website of the plugin. Once you’ve configured the plugin, you can then begin adding your book reviews to your website. 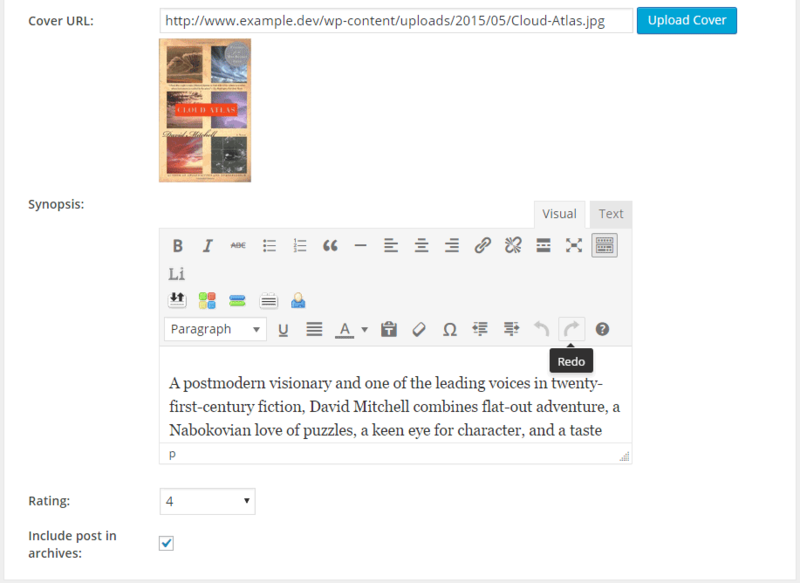 The Book Review plugin adds a series of fields to the WordPress post editor screen. These can be found in the Book Info meta box. If you’ve entered your Google Books API key, you can auto-populate some of these fields. As well as the fields pictured above, you can also upload a picture of the book, enter a synopsis, and give the book a rating. Once you’ve added the review content, you can preview your post to see how it looks. The plugin also includes a shortcode which can be used to list the reviews you’ve published on your website, in one place. You can view the details of the shortcode in the online plugin documentation. Book Review is a really useful plugin that is helpfully very well documented. Anyone who occasionally or regularly publishes book reviews on their blog will be able to make good use of it. By getting a Google Books API key, you can really save yourself a lot of time when entering the book details, especially if you are frequently reviewing books on your WordPress website. If you are seeking a way to format and present your book reviews on in an attractive way, then the free Book Review plugin could be just what you are looking for. No problem, its a good plugin! Just a shame the Google Books setup is a bit tricky – not your fault I know. Will take a look at the roadmap.